The CSA7404B reduces product development time by providing one tool that spans circuit development and physical layer testing. With this family, engineers can test designs for compliance to network communications standards as well as analyze critical internal parameters such as signal integrity, timing margins, and jitter. 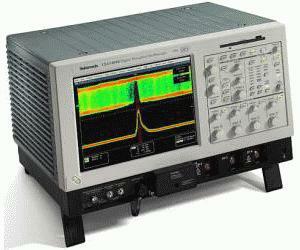 The CSA7404B has 4 GHz true analog bandwidth, a 20 GS/s maximum real-time sample rate, and more than 400,000 wfms/s waveform capture rate, enabled by exclusive DPX? acquisition technology, to rapidly acquire electrical and optical signal information not revealed with other analysis tools. Integrated broad wavelength optical response, clock recovery, serial pattern triggering, and mask testing make testing faster, easier, and more efficient. Innovative software solutions deliver domain expertise for advanced analysis and compliance testing, while the OpenChoice? architecture enables users to integrate their expertise through the ability to easily write custom programs, or utilize popular commercial software. Instrument operation is familiar and intuitive through direct controls and a graphical user interface. This unique combination of superior measurement fidelity, unrivaled analysis, and uncompromised usability speeds the development of network communications circuit designs.